A few months ago, I ran into a couple of friends in a local bakery, and in conversation told them about the historical research I've been doing on the paranormal. One of my friends told me that her mother had gone to the Philippines (where her father currently lives), and was clearing his house of its ghosts. I was really curious about this, and some weeks later had an opportunity to sit down with my friend's mother, who likes to go by the nickname Mama, to talk to her about the experience. In the late 1990s, Mama's mother-in-law died, and her husband returned to the Philippines to take care of the family property. He moved into her house in Manila, and ever since, strange things have been happening in the house. Many people have sensed a presence there, while others have reported apparitions, the regular sound of someone walking up the stairs, doors closing on their own and electric fans turning on by themselves. Several years ago, my friend went to visit her father in Manila and had a strange experience of her own. "My Dad let me stay in his room while he stayed in the other room," she told me. "One night, I was in his room and he was watching TV in the other room. I thought I heard him calling out to me. I peeked out my door and I saw what I thought was him with white stockings on his feet, running from the hall into the room, which is weird because he doesn't wear socks around the house." She went to his room to ask what he wanted. He was just relaxing in his bed, barefoot as usual. "I asked him what he needed and he said he didn't call me. I told him what I saw, and he said, 'You know I don't wear socks in the house.'" She added that she really doesn't want to know about the haunting there because it makes her feel a bit paranoid. But Mama was eager to tell me all about it. She told me of how, being a Roman Catholic family, the house had been blessed on a few occasions. But soon after each blessing, the ghostly incidents would resume. Late last year, her husband had hired a cook to work in the restaurant he owns. The cook and his wife came from another village about two hours from Manila and they needed a place to stay until they got settled in the city. Mama's husband offered them a room for a few weeks. 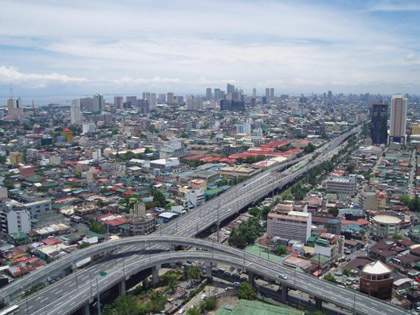 The bustling city of Manila, Philippines. One night, when her husband was out, the couple heard someone in the kitchen. There was the sound of dishes as if they were being cleaned. They went downstairs to greet Mama's husband, who they thought had just returned home. But there was no one there. The next day, they asked Mama's husband if he had been in the kitchen at this time, but he said he hadn't returned home yet. The couple were unnerved by the experience. Mama's husband decided to call in an older woman who believed in the supernatural and could perform a ceremony to rid the house of its unwanted and unseen guests. When she entered the house, she told Mama's husband that she saw a lady sitting at the dining room table, her head bowed. The woman did a rite involving a chicken, gin and candles, and for a while all was quiet. But soon, the haunting resumed. Mama's husband told Mama of this when he came to visit her in Toronto, Canada last January. In Toronto, Mama has a friend originally from Jamaica. Her friend had told Mama about how her home in Jamaica had been haunted, and she had learned a procedure to get rid of the ghosts. With many strange, often frightening reports, Mama was willing to try something new to clear family home in Manila of its ghosts. The procedure would take nine days to complete and would have to be performed on each of those days just before sunrise. In early April, Mama was visiting her husband and decided to undergo the process her Jamaican friend had advised her to try. It was around midnight, and Mama had to get up in a few hours to do the lengthy initial procedure to exorcise the house. "I woke up, and by our window, it sounded like birds were coming. They were so loud, but I couldn't see anything because it was dark," she told me. No one else had heard the strange sounds. She wondered if it was a sign that someone knew Mama was going to try to rid the house of its spirits. Filipinos have a long-standing, rich mythology, and continue to experience apparitions and ghostly activities within the context of traditional beliefs. 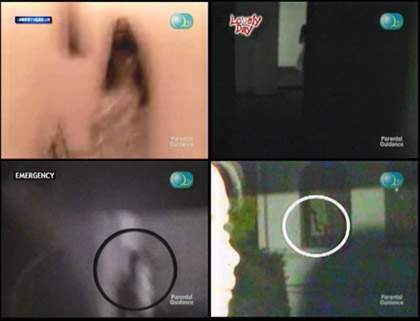 A recent news story featured video captures of alleged "multos" (the Tagalag word for ghosts). Interestingly, they seem to share the girl with long dark hair wearing a nightgown or dress as has often been captured on videos since the popular movie "The Ring" was released. The link for the video is at the bottom of this article. In the early hours of the morning, Mama and the housekeeper started the process of clearing the house. They had many different items her Jamaican friend recommended she use: salt, hot chillies, chayote, green lemons, red candles, gin and so on. Outside of the house, she filled a glass with gin and took a fistful of salt, and threw them both to the ground. "My friend told me to say, 'Go away! Don't come back!' like you're really mad! So I did that," said Mama. The two women went through the entire property with frankincense, spreading the various items around to repel whatever spirits were haunting the home. The initial procedure was completed before sunrise. On each of the nine days, before the sun rose, Mama read a prayer from the Bible, Psalm 97, while facing to the east. But on the ninth day, Mama wondered if all of her prayers had been in vain. She stood in a room reading the prayer one last time when she felt a breeze. She looked and saw that the electric fan was on. It was very strange that the fan would be on so early in the morning, for it was always left off during the night. As Mama told me the story, she rationalized the maybe the fan had been left on, but she was quite certain it was not, and that it turned on by itself while she was reading the prayer. Her husband further verified this when told her he had not turned on the fan before going to bed. "I thought to myself, 'Oh shoot!' What was going on?" she said. "This was the ninth day! But you cannot fear. You have to be strong. This is my house." To Mama's knowledge, all has been quiet in her husband's house in Manila since she did the procedure. But things have always been quiet after blessings have been made, leaving one to wonder if the ghosts might return. Mama hopes they don't. The Philippines has a rich mythology passed on from the many tribes who lived there before the Spanish brought Catholicism to the islands. Among the tales you will read about are tree spirits, including fairies, dwarves and giants, all of whom live in or around the trees in the forests. This rich folklore still lives on today, as Mama told me about how there is a tree on her husband's property that is thought to have spirits. One person reported seeing a kapre (a tall, dark giant) in the tree coming to the house one night. To ensure the tree spirits are happy, people leave offerings at the tree.